In 2014, A-one+ picked 8,895 bags of litter from the Area 12 (Yorkshire & Humber) project, and in 2015 A-one+ picked 13,780 bags of litter. This 2015 figure represents a 55% increase since 2014. Putting this in context, in 2015 A-one+ picked on average 53 bags of litter every weekday of the year – laid side by side enough to cover the pitch at Wembley Stadium. Roadside litter can lead to hazards for other motorists if it is thrown from moving vehicles, cause a threat to wildlife and lead to flooding if drains become blocked, as well as having a detrimental effect on the appearance of sites. It also puts the workers who are collecting the rubbish from the side of busy motorways at risk. A-one+ have recently been focusing on this blight of litter on the strategic road network and have considered new ways to tackle this age old problem. Working closely with the client, Highways England, A-one+ developed a multi-faceted programme of education, enforcement and engineering. 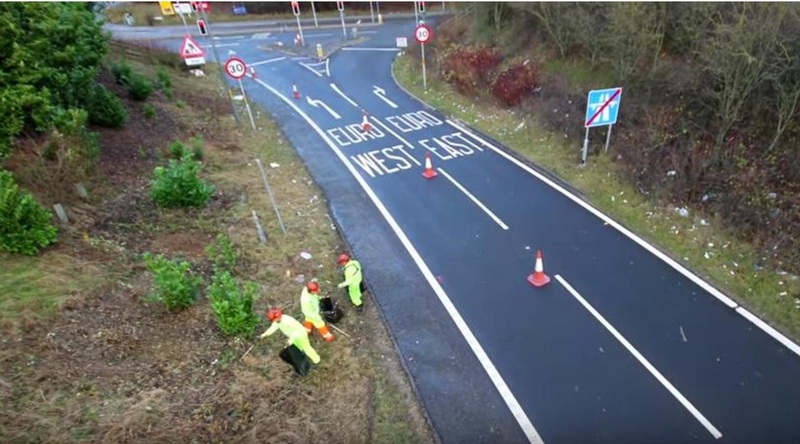 Part of this programme included time-lapse photography and a video on the M606 motorway to highlight how quickly litter can build up again after the expense and time of clearing it in the first place. The video features ‘grab-cam’ footage where a camera was secured to a litter grabber to show a few of the thousands of individual pieces of litter collected. The finished time-lapse photography has now been used to support a national litter campaign in early 2016 to highlight the problem to road users. It has also been shared widely on social media to reach as many people as possible so that together in partnership we can improve the appearance of our sites.